Petroleum is a naturally occurring complex mixture made up predominantly of carbon and hydrogen compounds, but also frequently containing significant amounts of nitrogen, sulfur, and oxygen together with smaller amounts of nickel, vanadium, and other elements. Solid petroleum is called asphalt; liquid, crude oil; and gas, natural gas. Its source is biological. Organic matter buried in an oxygen-deficient environment and subject to elevated temperature and pressure for millions of years generates petroleum as an intermediate in the transformation that ultimately leads to methane and graphite. The first successful drilled oil well came in 1859 in Pennsylvania. This is considered to be the beginning of the modern oil industry. Continuous distillation of crude oil began in Russia in 1875. Oil is the largest segment of our energy raw materials use, being 40 percent, while coal use accounts for 27 percent, gas 21 percent, and hydroelectric/nuclear 12 percent. Although there are 20,000 petroleum fields known worldwide, more than half of the known reserves are contained in the 51 largest fields. The Middle East has 66 percent of the known world reserves. The United States has only 2 percent of the known world reserves. Hence the need for imports. The Organization of Petroleum Exporting Countries (OPEC) is important to the international trade and distribution of this crude oil. There is a growing dependence of the United States on imports. Although U.S. domestic production has not grown since the 1950s, imports have grown dramatically, from 0.3 billion barrels of oil in 1955 to 3.0 billion barrels in 1997. The United States has increased its percentage of imports, from approximately 13 percent in 1970 to 55 percent in 2000. It uses approximately 18 million barrels of oil per day. Worldwide production is about 56 million barrels per day. With known reserves, this level of worldwide production could remain constant for only 43 years. But there are large volumes of unconventional petroleum reserves, such as heavy oil, tar sands, and oil shale. These are located in the Western Hemisphere. Improvements in recovery methods must be made, and the cost of production must decrease, for these sources to become more important providers of energy. 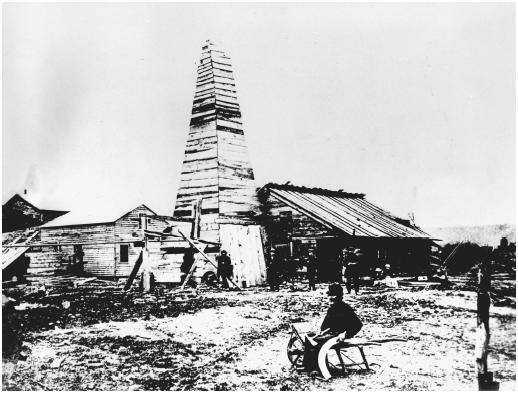 The world's first oil well, near Titusville, Pennsylvania, 1863. Crude oils vary dramatically in color, odor, and flow properties. There are light and heavy crude oils; they are sweet or sour (i.e., have high or low sulfur content, with an average of 0.65%). Several thousand compounds are present in petroleum. The number of carbon atoms in these compounds can vary from one to over a hundred. Few are separated as pure substances. Many of the demands for petroleum can be served by certain fractions obtained from the distillation of crude oil. Typical distillation fractions and their uses are given in Table 1. The complexity of the molecules, their molecular weights, and their carbon numbers increase with the boiling point. The higher-boiling fractions are usually distilled in vacuo at temperatures lower than their atmospheric boiling points to avoid excessive decomposition to tars. SOURCE : Wittcoff, Harold A., and Reuben, Bryan G. (1996). Industrial Organic Chemicals . New York: John Wiley. <20°C Gases Similar to natural gas and useful for fuel and chemicals. 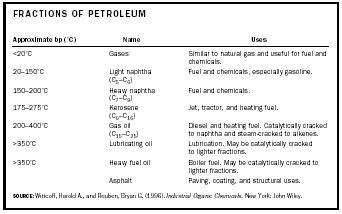 20–150°C Light naphtha (C 5 –C 6 ) Fuel and chemicals, especially gasoline. 150–200°C Heavy naphtha (C 7 –C 9 ) Fuel and chemicals. 175–275°C Kerosene (C 9 –C 16 ) Jet, tractor, and heating fuel. 200–400°C Gas oil (C 15 –C 25 ) Diesel and heating fuel. Catalytically cracked to naphtha and steam-cracked to alkenes. >350°C Lubricating oil Lubrication. May be catalytically cracked to lighter fractions. >350°C Heavy fuel oil Boiler fuel. May be catalytically cracked to lighter fractions. Asphalt Paving, coating, and structural uses. naphthenes; and 20 aromatic compounds (such as benzene, toluene, and xylene). 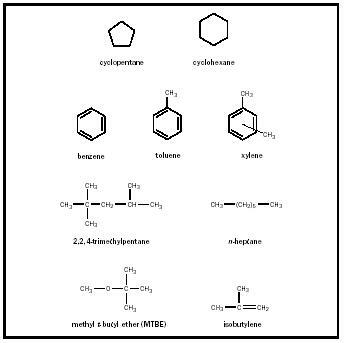 Examples of compounds found or used in petroleum and mentioned in this article are given in Figure 1. When any fraction of petroleum is used as a source of energy and burned to CO 2 and H 2 O, the sulfur is converted into SO 2 in the air. The SO 2 is a major air contaminant, especially in larger cities. With air moisture it can form H 2 SO 4 and H 2 SO 3 . Much of the sulfur-containing material must be taken out of petroleum before it can be used as fuel. The current maximum percentage allowable in gasoline is 0.10 percent S.
Figure 1. Some compounds found or used in petroleum. mixture that gives the same amount of knocking as the gasoline being measured. Thus, a high octane number means a low amount of knocking. Presently there are two octane scales, a research octane number (RON) and a motor octane number (MON). RON values reflect performance at 600 rpm, 148.8°C (125°F), and low speed. MON is a performance index of driving with 900 rpm, 51°C (300°F), and high speed. The station pumps now give the (R + M)/2 value. Regular is usually 87 to 89 and premium about 92 on this scale. The octane number increases as the amount of branching or the number of rings increases. The octane number increases as the number of double and triple bonds increases. An oil refinery at Cap Bon, Tunisia. hydrocarbon makeup. They were also interested in cleaning up the exhaust of automobiles by eliminating pollutants such as unburned hydrocarbons and carbon monoxide through more complete combustion. By far the best substance that they found was tetraethyllead. Lead in this form aids in breaking carbon-carbon and carbon- hydrogen bonds . But the lead oxide formed in the combustion is not volatile and would accumulate in the engine if dibromoethane and dichloroethane were not added. In the environment the lead dihalide formed undergoes reaction by sunlight to elemental lead and halogen , both of which are serious pollutants. Figure 2. Petroleum refining processes. emission control systems may make this high-level input unnecessary. Currently MTBE accounts for 85 percent of the additive market, with 7 percent being ethanol and the remaining 8 percent split by other chemicals. In 1999 California took steps toward banning MTBE. In 2000 some factions called for a U.S. ban on MTBE and for increased use of ethanol to meet the oxygenate requirement. MTBE has been found in drinking water. But ethanol cannot be blended into gasoline at the refinery because it is hygroscopic and picks up traces of water in pipelines and storage tanks. Also, ethanol shipped away from the Midwest, where it is made by corn fermentation, would add to the cost of gasoline. Gasohol may increase air pollution because gasoline containing ethanol evaporates more quickly. Studies and debate continue. There are processes that are used to refine petroleum into useful products. These are important processes for the gasoline fraction because they increase the octane rating. Some of these processes are used to increase the percentage of crude oil that can be used for gasoline. They were developed in the 1930s when the need for gasoline became great with the growing automobile industry. These processes are also keys in the production of organic chemicals. An example of each of these processes is given in Figure 2. One process is cracking. In catalytic cracking, as the name implies, petroleum fractions of higher molecular weight than gasoline can be heated with a catalyst and cracked into smaller molecules. This material can then be blended into the refinery gasoline feed. Catalytic reforming leaves the number of carbon atoms in the feedstock molecules usually unchanged, but the resultant mixture contains a higher number of double bonds and aromatic rings. Reforming has become the principal process for upgrading gasoline. High temperatures with typical catalysts of platinum and/or rhenium on alumina and short contact times are used. A typical example is the reforming of dimethylcyclopentane to toluene. Straight-run gasoline can be reformed to as high as 40 to 50 percent aromatic hydrocarbons, of which 15 to 20 percent is toluene. 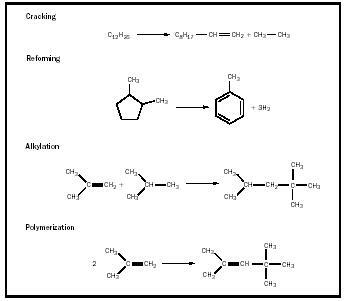 Although cracking and reforming are by far the most important refinery processes, especially for the production of petrochemicals, two other processes deserve mention. In alkylation, alkanes (hydrocarbons with no double or triple bonds) react with alkenes (hydrocarbons with double bonds) in the presence of an acid catalyst to give highly branched alkanes. In polymerization an alkene can react with another alkene to generate dimers, trimers, and tetramers of the alkene. As an example, isobutylene (C 4 ) reacts to give a highly branched C 8 alkene dimer. 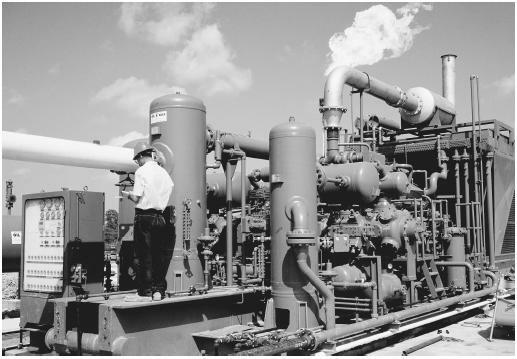 Natural gas can be as high as 97 percent methane, the remainder being hydrogen, ethane, propane, butane, nitrogen, hydrogen sulfide, and heavier hydrocarbons. A typical mixture contains 85 percent methane, 9 percent ethane, 3 percent propane, 1 percent butanes, and 1 percent nitrogen. Uses of natural gas by all industry include fuel (72%) and the manufacture of: inorganic chemicals including ammonia (15%), organic chemicals (12%), and carbon black (1%). The ethane and propane are converted to ethylene and propylene. The methane is purified and used to make a number of other chemicals. SEE ALSO Energy Sources and Production ; Fire, Fuels, Power Plants ; Fossil Fuels ; Gasoline ; Industrial Chemistry, Organic . Chenier, Philip J. (2002). Survey of Industrial Chemistry, 3rd edition. New York: Kluwer Academic/Plenum Publishers. Wittcoff, Harold A., and Reuben, Bryan G. (1996). Industrial Organic Chemicals. New York: Wiley. I was unable to understand octane no.but after reading this article..I totally understood it...it was explained as a story which gave it a best way to understand.